The story begins with the record. Bruce McLaren barely had one Grand Prix season under his belt when he became the youngest ever racer in the history of Formula One (22 years and 80 days) to win a race – the United States Grand Prix in 1959, driving a Cooper. His record stood until 2003. Born on 30 August 1939 in Auckland, this son of an excellent motorcycle racer turned service station owner seemed destined to a career on the rugby field until a serious leg fracture caused him to hang up his boots definitively. He took part in his first motorsports competition at the age of 15. He moved to Europe and picked up experience in a range of disciplines before making his Formula One debut at the Germany Grand Prix in 1958. McLaren went on to win numerous titles and then in 1963, while still involved in F1, founded Bruce McLaren Motor Racing, which was tasked with custom-building cars to race in the Tasman and Can-Am series. Like Jack Brabham who had served as his mentor, Bruce McLaren decided that he wanted to stand on his own two feet at the end of the 1500 F1 season. He left Cooper – where he had become the premium driver – to set up his own Formula One racing team. He enlisted the help of a young promising engineer – Robin Herd – to design his first 3 L Formula One car at the start of the 1966 season. Herd opted for a monocoque design made of Mallite – a laminate composite material formed of a core sheet of end grain balsa wood faced by two sheets of aluminium alloy, giving it high torsional strength. Such levels of rigidity remained unrivalled until the 1980s with the arrival of carbon fibre shells. 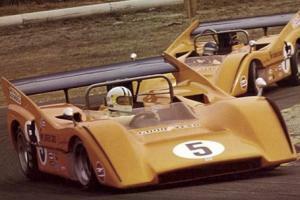 During his first season racing as part of his own team, Bruce McLaren had more than his fair share of disappointments. 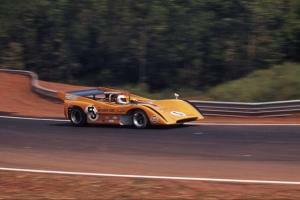 Presented at Rétromobile, the first McLaren Formula One racing car – the M2B – is powered by a Ford Indy V8 engine. During the course of the season, this was replaced by a Serenissima V8, which slightly improved results. 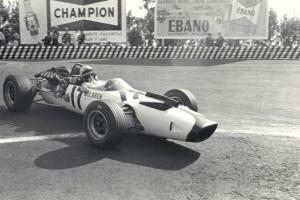 They were won by McLaren drivers every year from 1967 until 1971. Bruce did not compete in the 1970 season. 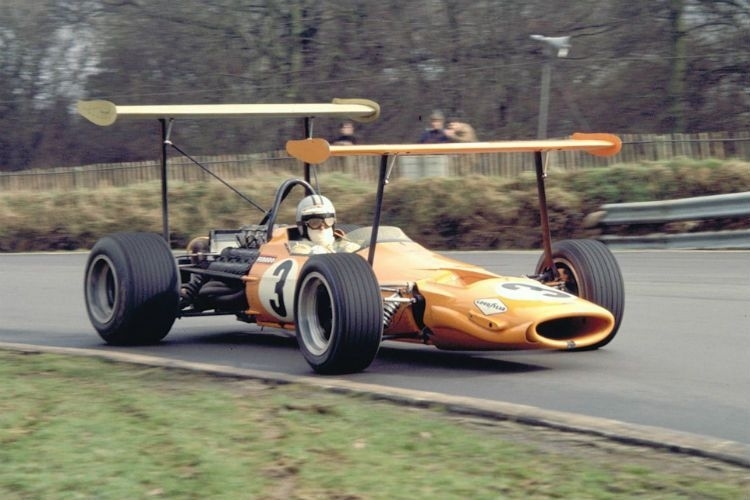 During a series of private test drives, the driver-constructor was killed on the Goodwood Circuit on 2 June 1970, driving the M8D with which he would have competed on 14 June at Motsport. His team survived him, but it wasn't until 1974 that it took its place in history, winning the two Drivers’ and Constructors’ Championships with Emerson Fittipaldi. James Hunt accomplished the same feat two years later at the end of a hotly disputed season against Ferrari's Niki Lauda. 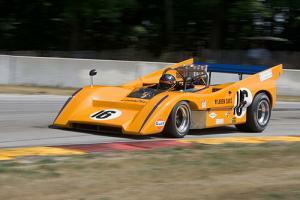 With the arrival of skirts and turbocharging, McLaren – like other teams in the 1970s – fell in line. The arrival of Ron Dennis, Brabham’s old mechanic, as team principal and the recruitment of engineer John Barnard heralded a new period of success. With the carbon fibre chassis MP4/1, Barnard created a Formula One car that ended up with quite a following. Powered by a TAG-Porsche turbo V6, McLarens driven by Niki Lauda and Alain Prost together claimed all titles and victories. The Woking team was at its zenith when Ayrton Senna joined Prost. In the 1988 season, McLaren literally crushed the competition, winning 15 of the 16 races which made up the championship, achieving 10 doubles and finding itself in pole position 15 times. The single-seater MP4/4 proved to be one of the most dominant Formula One machines ever built, given a major boost by its Honda engine. Ayrton Senna saw his talent rewarded with a Drivers' Championship win. It was around this time that Gordon Murray joined McLaren as Technical Director. Talented and entrepreneurial, Murray – like Dennis – undreamed of creating the ultimate supercar. 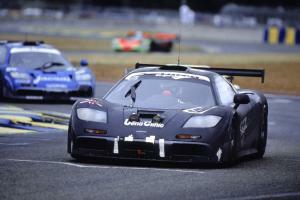 It ended up being the McLaren F1 – a GT with three front seats powered by a 6 L BMW V12 engine. A competition variant of it was built that went on to win the 1995 24 Hours of Le Mans. The car was driven by a Japanese team and was not one of the favourites to win. However, it was piloted without fault in driving rain by Yannick Dalmas, helping him to cement the third of his four Le Mans victories, alongside JJ Lehto and Masanori Sekiya. Today, McLaren is the most successful team in Formula One history – behind Ferrari – and is the oldest active team. This year, it is commencing a new chapter, having agreed a deal to have its engines supplied by Renault.